Here in the Texas Panhandle it is spring. I hope you’ll are having a wonderful spring (or fall in the Southern Hemisphere). Here in Amarillo we are rocking between absolutely gorgeous days and days that have carried over from March with all the winds. We could do without the wind, but then it would not be the Texas Panhandle if the wind did not whip-up every once in a while to remind us how changeable our weather can be. For those of us who do no have beds to start working, a few flower pots on the patio could yield all the wonderful scents Rod and I experience in our herb bed. I would whole heartedly suggest a walk through the nearest Botanical Garden or a wonderful walk in the park or around the lake. Just get out and enjoy the wonderful weather. Walking is one of the best exercises. 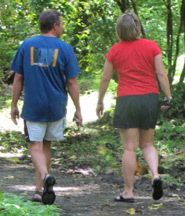 Don’t be like the couple in the picture to the right, be sure to wear your support stockings while walking to increase your circulation and improve your leg health. please scroll to the bottom and leave a comment as a guest. Be sure to encourage your friends and family to enjoy a garden.